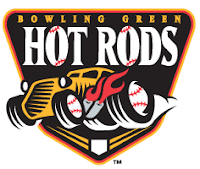 The poll for the RP Readers Choice MVP's for the Bowling Green Hot Rods has closed and here are your results..
Dietrich was the big bat of the Hot Rods lineup, leading the club in slugging (.502) and home runs (22) while placing near the top of all offensive categories. His efforts at the plate led him to being named Player of the Week for the Midwest League twice this season and earned a spot on the midseason all-star team. Dietrich finished the season with a .277 average, 34 double, 4 triples, 22 homers and 81 RBI's in 127 games this season. Dietrich was drafted by the Rays in the 2nd round of the 2010 Draft out of Georgia Tech. Jensen led the Hot Rod pitching staff in wins with 13 on the season. He finished the year with a 13-4 record, 4.28 ERA and 88 strikeouts in 26 games on the mound. Jensen was drafted by the Rays in the 46th round of the 2010 Draft. 216 readers participated in the Hot Rods poll. Below are the top five of each category as chosen by the readers of Rays Prospects. Tomorrow's poll will highlight the Charlotte Stone Crabs. I am curious why people picked Jensen as the pitcher of the year for Bowling Green. As far as I can tell his season was rather pedestrian, certainly compared to that of Riefenhauser and Rearick. Was it because he pitched more innings than those two? If so, why not select Mateo who had even more and better numbers? Was it purely the wins advantage or the W-L%? Did many voters see the various candidates pitch and single him out as most impressive? This is not a criticism-not at all. It just surprised me, and I wonder what the reasoning was that led to his selection. C.J had an nice year,and,Rearick was impressive,Mateo threw a no hitter !!! Jenson and his 4.28 ERA over Rearick,etc???????? That's a joke!!! I think the Jensen family found out about this site and voted for him. Jenson had a great 2nd half. So, congrats to him and to all of the other pitchers listed here. They are all very good, and have shown some great success at Bowling Green. So is your answer to my question (and I repeat, it is a question, not a criticism) that people were so impressed by his second half that they voted for him over pitchers who had better stats overall? What continues to puzzle me is that in their last 10 appearances, both Rearick and Mateo had comparable, even slightly better stats than Jensen. That is not the entire second half, and it does appear that in the last 8 appearances Jensen was more consistently good than either, but that seems an awful small sample on which to base the vote. Please do not interpret what I am writing as intended to demean Jensen. Congratulations to him not just for winning the award but for putting himself in a position to be considered. I am simply trying to understand the reasoning behind the vote, and as I have not been in Bowling Green this year, I have to rely on the stats and what others say. I voted for Jensen too and am not related. Congratulations to him. I don't understand what appear to be hostile responses to my question. I have tried to make clear that I simply was curious as to the reason for the selection, and I never suggested anyone voted because s/he was related to Jensen nor that my opinion was some criteria others had to abide by. Do some people find it inappropriate to be interested in people's reasoning? You solicited responses for the motivation behind casting votes for one player over another because, as you stated, "what continues to puzzle me is that in their last 10 appearances, both Rearick and Mateo had comparable, even slightly better stats than Jensen." It is not inappropriate to be interested in other people's reasoning. However, to pepper your solicitations by injecting the statistical merits that you heavily emphasize within your comment is highly insulting. Have you stopped to think that Jensen is a fan favorite due to the fact that he gave a solid performance on field (look at the WINS column) and because he is a role model to those that follow the Rays organization? I find it particularly amusing that we look at these boys as work mules, forgetting that character is just as important a part in the playing process. Someone with character can overcome a bad inning, just as someone with character can be sent in with bases loaded and no outs and be depended upon to deliver when the times are tough. Yet someone who is of poor moral fortitude can have a couple of fantastic games statistically, but will burn out very quickly because the fame and the glory goes to their head. If you need evidence of this, check out the stats of some of the largest signing bonus players taken first or second round of the 2010 draft. I am sure Tampa Bay would love to include a money back clause at this point. Care to provide your thoughts on MY reasoning? Yes, I am glad to respond to your reasoning. If you feel he deserved the honor because of his character, that would have sufficed as a response to my question. I might have engaged in a discussion of whether the argument you make is convincing to me, or I might simply have let it go without responding. In any case, it would have addressed my question directly, and I would have learned something about why some people voted for Jensen. I think it is interesting to discuss the relative significance of on-field performance, character and such in evaluating players and their potential. For my part, I have remained optimistic about Tim Beckham, for example, because although many have been disappointed by his performance (although less so this season), I had read that he was a dedicated ball player and a young man of solid character. Thus, in my view, there was plenty of room for optimism that he would address the weaknesses in his game and improve. I am hoping that his performance this year indicates that is what is happening. On the other hand, I do place great emphasis on progressive statistical analysis when evaluating players, and while fully aware they are human beings with all that entails, I think I am in tune with the Rays organization to consider statistical analysis a major factor in reviewing a prospect's status. Naturally in framing my question, I do those who read my post the courtesy of knowing my perspective. To be insulted by such a questioning seems to me perversely wrong-headed. I went with Price and Rearick, with Dietrich and Riefenhauser in 2nd. I would guess Jensen voters went with wins and innings, he did eat up a lot of them. Don't know if Tom or BG keeps track of run support by starter, but I'd bet Jensen had the highest. Nothing wrong with voting how you believe, I did and my picks finished in 3rd and 4th places, so what do I know? I did think Mateo would finish higher, the no-hitter and all. After the no-no he didn't make another start until late in the year, came out of the pen, didn't know if people noticed that, guess they did. Can't wait to see the discussion for Montgomery Hitter of the Year. I'll bet we hear from STDRays and the other Wrigley-ites on that one. He did lead the Biscuits in ABs by quite a bit, guess it'll be another quantity vs quality argument like Jensen. And don't forget those 13 errors (9 at 1B, 3 at 3B, 1 in LF)! And for the record, I don't think Robert meant it like "explain your vote idiots" at all. He's been around a while here and at RI, and hasn't been that way. I could see how you'd read it that way, but I think he was just wondering why. If nothing else it's brought some attention to Jensen, who led the entire org in wins. Doubt even his family would have predicted that before the season. Thank you Doug. I most certainly did not mean to imply that people who voted for Jensen were wrong, let alone idiots. How could I? I pointed out that I have not seen the Hot Rods play this year nor did I have any knowledge beyond the raw and incomplete stats on which to judge. That was why I was so interested in why people selected him; I wanted to learn something. And I thought that in every post I made my point clear by stressing I was simply interested to know the reasoning, not that I disagreed with the choice. In fact, I was a bit confused when the first anonymous said s/he agreed with me as I had not offered any opinion, just some tentative thoughts framed as a question. Perhaps it is my writing style, although I don't see that, and if so, I apologize if anyone thinks I was being dismissive. Robert, the only thing you said was that his "season was rather pedestrian". Then the other anons commented, and when responses came in it was easier to mention you than the anons, since you started it after all. Was his season pedestrian? Depends on what you expected. He was a 46th round pick in 2010 and played for Princeton after signing. He made one start and 11 relief appearances and had a nice 2.97 ERA over 36.1 innings. Decent SO and BB rates, but his H/9 and esp HR/9 were a little high, but this was only 36 IPs. Based off all that I think his 2011 season was exceptional: moved up to full-season ball and made 26 starts with a 4.28 ERA, 13-4 record. But, if you compared him to all the other starters in the Rays org, then his 2011 starts to look pedestrian, but maybe not as much as you would think. He went from an afterthought who could be released at any time to a guy you pencil in as a starter at either BG or Charlotte next year. That's a nice jump! I'd still put him in the category of org player. I've always been high on Alex Cobb, and Jensen isn't far off Cobb's 2008 at Columbus. The big difference is the hit rate, guys who become top pitching prospects tend to have low H/9. Jensen was also a little older, higher ERA, little higher walk rate. But SO, GS/IP, HR/9, etc were similar. But to develop on a Cobb-like path he's got to become less hittable, combined with a higher walk rate he just puts too many guys on. Moving up against better hitters he'll get clobbered if he doesn't bring his H/9 down some. I'm not saying he profiles like Cobb (different body, not as good at the same level), but that's who came to mind as an under the radar type with somewhat similar stats. Plus Cobb had an unusual career path, not many increase their SO rates as they move up, can't expect Jensen to do that. I also don't want to get to down on Jensen, he made great strides in 2011. He would just have to make a similar improvement/jump in 2012 to get on the prospect radar. I don't think he has the upside to do that a second time, esp against better hitters. Again, thanks. I love hearing about Rays prospects, especially those not generally on people's radar. I confess it did not seem to me anything pejorative, just descriptive, when I used the term pedestrian. Except for the W-L record, I thought it was pretty accurate, especially compared to numbers put up in BG by others. I thought appending the phrase "as far as I can tell" before using that term indicated that I recognized my information was incomplete, and I simply hoped others who had more data or insight could fill me in. Perhaps I was conflated with some of the anons in people's minds. What you say fills in quite a bit. Naturally I would love to see Jensen develop as Cobb did. I tend to look at BB, K and HR rates, and he seemed no better than average in all three. I don't think 21 is old for the league, but it isn't young either, and a K rate under 7 does not bode well in my view. Of course, I know nothing about him personally, and perhaps his make-up is such that he will continue to improve or find ways to succeed despite ordinary peripherals. If Jensen were a 2nd round pick, this conversation would not be happening. Instead, he would be a "prospect" with potential, and on the radar. As far as age, he's only 6 months older than Cobb was at low A, but on bbref he shows as a year older since they use the mid-summer age as the age for the season. I just didn't want people to think he was a whole lot older than Cobb was. Makeup means a million different things with prospects. Here it refers to on the field things, Jensen's ability to ride out tough situations. I agree that's great to have, but it's so hard to know if it's true. Maybe when he had a bases loaded 1-out situation he was scared to death and just threw it up there and got an inning-end DP, or maybe he dug in and battled through, who knows. The 2nd part of makeup is smarts and attitude, basically can and will you take the coaching/instruction and apply it to become the player you are capable of. You have to be able to learn, and you have to be willing to apply what you've learned. If you do both of those you can reach your potential. Work ethic is part of attitude, some can agree to apply what they've learned, others work their butts off doing it. The first part seems simple, just don't be a jerk. The second part is a little harder, assuming they have the intelligence, how bad do they want it? It might seem obvious that they all want it, but it's a long season (and off-sesaon) to keep it going 100%. Especially if teammates don't have that attitude, peer pressure type thing. Well, enough about makeup, Cobb, Robert, and Jensen, time to watch the Rays! No question that being a high draft pick provides helium for prospects as there is an assumption that there was enough promise at the start so that even a mediocre performance does not lead to automatic pessimism. On the other hand, more is expected of a second round pick. I think were Jensen a second round pick who ended the season with his stats, there would be disappointment, and while he might remain on the prospects list, he probably would fall some as Jake Thompson probably will at the start of next season. In fact, it is possible that he would get less support for this sort of honor as he would have missed the heights many hoped for. I think Doug's point is excellent. Since little was expected, Jensen's season can be seen as a great step forward. The question is does that mean he pitched better than others on the team or simply that he pitched better than expected? For what it's worth, all of the Bowling Green Pitchers finished strong. The ERA's were way down for many of them in the 2nd half of the season.And they all work very hard and improve each outing. The lefty pitchers were pretty much dominate most of the time. You got to love that. But as a whole, they all have done very well and had a great season. First thing Who had the most wins on team? that would be Jensen. Who had the fewest losses? that would be Jensen. He set the all time single season win record? That would be Jensen. He didn't loose a game in the months of May, June and August. And one last thing, who did the Hot Rods have pitch game one of the playoffs? That what be Jensen once again. So I would say that the Hot Rods thought he was the best pitch on the team. And so what if his family found about the voting, maybe the other player's families should have voted for them. "The question is does that mean he pitched better than others on the team or simply that he pitched better than expected?" I believe he pitched well enough to garner enough votes to win the Reader's Choice award. As in any sport - no matter how great individual statistics... Whomever has the most points at the end WINS! True, but getting the most votes doesn't mean it was the right decision, only that most of the voters thought (or wanted to think) it was. That is why it is useful to hear and listen to the reasoning. While I think citing wins and losses is one of the weakest arguments for claiming a pitcher is good (I think teams, not pitchers, win games, even if we credit the pitcher in the stats), the last point, that Jensen was chosen to pitch the first playoff game is evidence worth considering. Perhaps the manager did indeed consider him the best pitcher-or at least the best starter. Then again, Riefenhauser was not there when the game was played, so we don't know if he would have been the choice.